Family Registration for NEW Membership is CLOSED! Family Registration for NEW Membership is OPEN! Students are not allowed on facility location unless they are registered in a class, or a study hall period, or attending an event. This is required to keep all students, tutors and the Journey Church safe. Registered students are welcome to attend Chapel and lunch time (between 12:10 - 1:00 pm). FCCT is for junior high and senior high school age students age 12-18. Participating students must be 12 yrs. old by November 1st and 18 or under by the beginning of the term. Classes are filled on a first-come first served basis. Registration begins mid-August and ends in the first week of September. From here, our public website (FCCT Public Website), review available classes on the Class Schedule & Registration page. If interested in signing your teen(s) up for classes; from our public website at the top right, click the Join button. Fill out the online Request Membership form, then pay the $60 family term registration fee (see due date above). When approved, you will be notified by email from our New Parent Coordinator. Login to your secure, private account on the website. 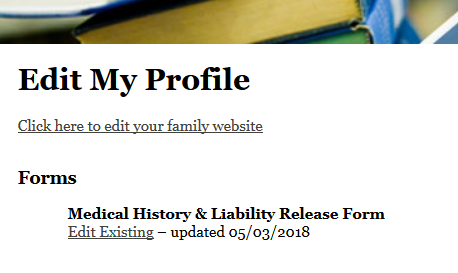 Then fill out the required Medical Release form; which is in your Profile page (due before the first day of class). Register your student(s) for classes when registration is open (see above). Late registrations are $65; after due date listed above. Pay the tutors directly by first day of class, or as determined by tutor. Classes meet once-a-week on Mondays with 4 class periods from 9:00 AM – 3:10 PM. We offer two 16 week terms per year: Fall (Sept-Jan) and Spring (Jan-May). We offer core classes (science, math, English, social studies) for 7th/8th and 9th/12th, as well as, elective classes (art, finance, character, music, languages,computer, etc.) for all grades. Periods 1 & 2 are (1:30) long to accommodate core classes with Periods 3 & 4 (1:00) for electives. Classes are broken down by grade by curriculum level and tutor planning. If you feel your child could participate in a class that is outside the listed grade range, please speak with the tutor of that class. Core classes will generally run both terms to complete the program year. First Class Clackamas Teens Program charges a family term registration fee of $60 each term (fall and spring). This is due with your membership request (no registration application will be processed without it) and before signing student(s) up for classes. Class fees/tuitions are paid directly to the tutor each term based on the payment schedule listed in the class catalogue. The class fee/tuition is listed in 2 ways by term and by month. The first is the total cost for the class for the term (i.e. $120). The second amount listed is the cost per month (i.e. $30). Since the term is 16 weeks it would equal 4 months (i.e. $30 x 4 months = $120). You may pay either way unless a tutor specifies otherwise. Please note that classes changed after the last day of registration will incur a $10 administrative fee payable to FCCT. There are no refunds for missed classes. Please pay the Tutors either in full at the beginning of the term, or in 4 payments on the first Monday of each Month. Once you sign up for a 16 week term, it is expected that you will complete that term and are responsible for the class fees of that term. If an emergency arises and you will not be able to complete the term, please let FCCT and the tutor know as soon as possible. A tuition fee reduction may be possible.